Call ASAP Bonding in Cobb County today if you need an affordable bail bond to get a family member or friend out of jail as soon as possible. At ASAP Bonding, we make the process of bailing people out of jail as easy as possible. Call us 24 hours a day — we’re always here and ready to help. as we make all of the required calls and take care of every scrap of paperwork. 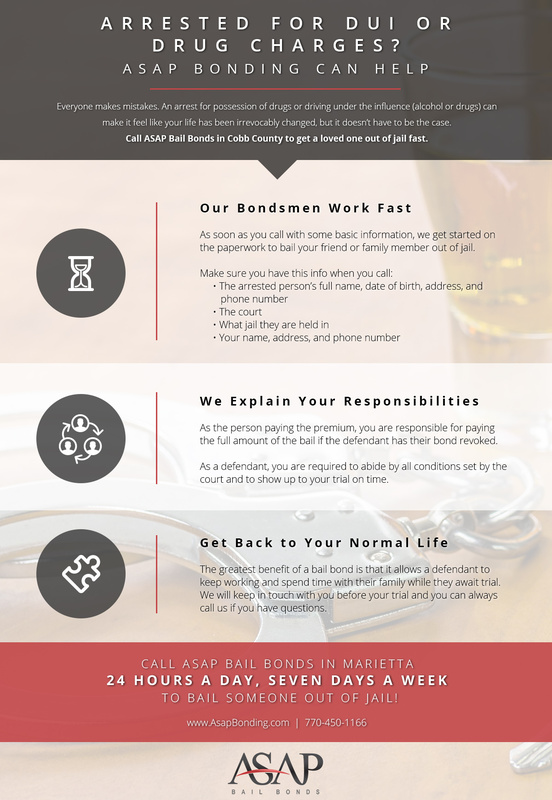 ASAP Bonding is here to provide affordable bail bonds to every resident of Cobb County, so call us today if we can help you get a loved one out of jail. Get directions to our office and find out more information here. 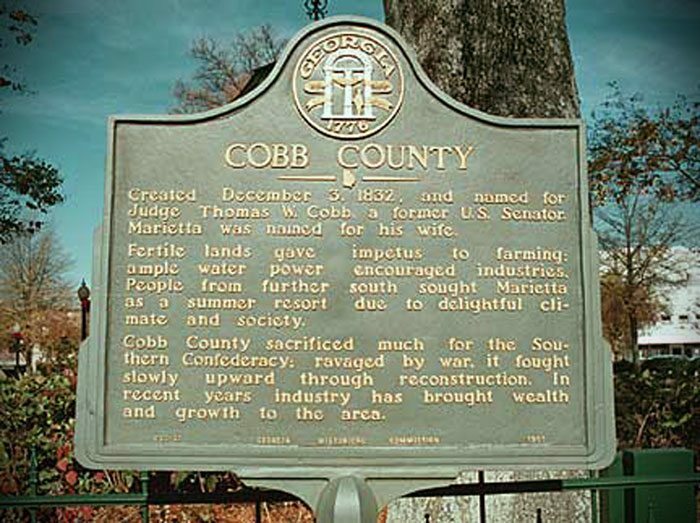 We serve the Cobb County communities of Marietta, Powder Springs, Austell, Smyrna, Kennesaw, Acworth, and Mableton. Visit us at our Cobb County facility. We are open 24/7. Having a friend or family member in jail can be an extremely confusing and difficult experience. Trying to work with the jail and the court system can make a tough time even harder. If you need to bond someone out, call us as ASAP Bail Bonds in Cobb County. We make it as easy on you as possible because we have the experience and resources needed to make things happen quickly. In addition to bail bonds, we also offer a free warrant search that covers the Atlanta metro area. Once we have that info, we start working on the paperwork to get them out. We pay the bail and you go to pick up your loved one. After they are freed and before the trial date, we will stay in touch with you and the defendant to answer questions about the legal process and to make sure they are going to show up for their day in court. In order to bail someone out of jail, the full bail amount must be paid. The bail will be returned to the person who pays it so long as the defendant shows up for his or her court date on time, but most people cannot afford to pay the full amount, so they reach out to a bail bondsman. A bail bondsman pays the full amount of the bail to the courts in exchange for a fee called a premium. The premium is a small percentage of the overall bail amount (generally 10 percent of the total). It is not refunded to the person who applied for the bail bond as it is the fee for borrowing the money from the bondsman. If the defendant doesn’t arrive on time for his or her court date, the bondsman will lose the entire bail amount and will then collect that amount from the person who took the bond out. This is why it is so important to make sure that the defendant follows all conditions of their bail and makes it to court when the trial is scheduled. We stay involved in the process until the trial is over because we want everything to go as smoothly as possible following an arrest. Bail allows people to live their normal lives while they await trial and we want to make sure that every resident of Cobb County has access to that right. Call ASAP Bail Bonds today. We work fast and we’re affordable. If you need to get someone out of a Cobb County jail, we’re your best bet. Through our website, you can post bail online or call us for a free, no-obligation consultation. Everyone makes mistakes. 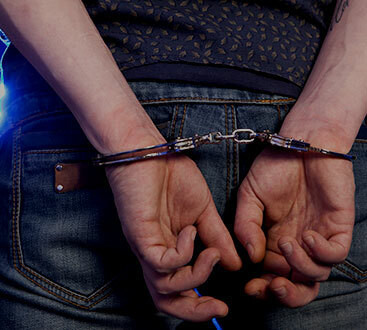 An arrest for possession of drugs or driving under the influence (alcohol or drugs) can make it feel like your life has been irrevocably changed, but it doesn’t have to be the case. Thanks to the bail system, and bail bonds, it is possible to get out of jail quickly. ASAP Bail Bonds in Cobb County is here 24 hours a day to make sure that you have access to a bail bond when you need it most. When you choose ASAP as your bondsman, you’re getting more than a simple bond. We believe in helping people learn from their experiences with the criminal justice system. 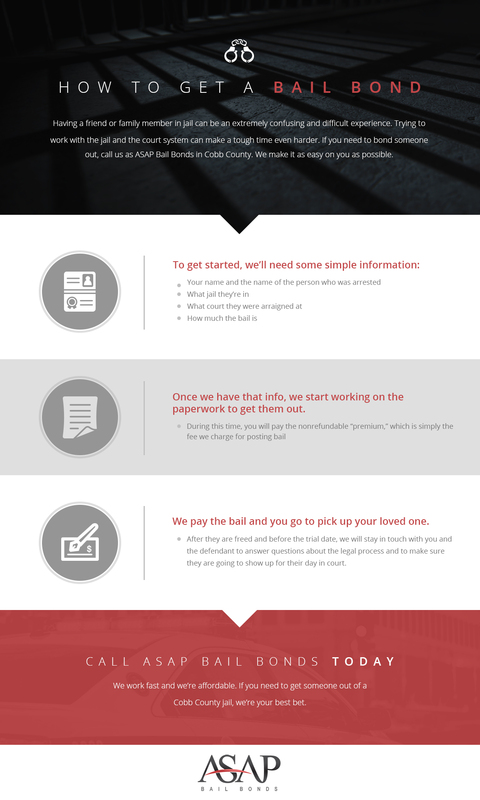 Below, you’ll find a number of ways that we work to help you when you’ve been picked up on a drug or DUI charge. Contact us today when you need to get someone you care about out of jail. It doesn’t take much to cross the line from having a good time to driving while under the influence. While the process of being arrested and booked can seem like it takes forever, we do everything we can to make the unpleasantness seem as short as possible. As soon as someone calls us, we get to work preparing all of the necessary paperwork to get the arrested person out of jail ASAP. Our bondsmen are highly trained and well-versed at the procedures, so you can pick up your family member or friend sooner rather than later. If you are the person who is paying for the bail bond, you have some important responsibilities. First, you are responsible for providing the money for the premium fees (usually a small percentage of the overall bail amount) and the collateral. This isn’t something that should be done lightly, so be sure that you understand what happens if the defendant doesn’t show up for court. 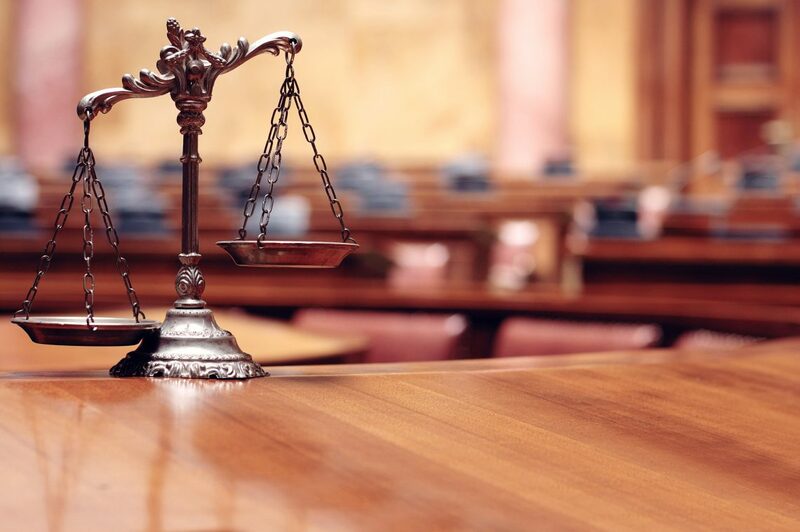 Part of our process involves talking to you and the defendant about the consequences of failing to appear — forfeiture of collateral and bail denial. Don’t let this one mistake ruin the rest of your life — if you do what the court says, the consequences for your actions will be far less severe than if you decide not to show up for court or you get in trouble again. One of the most important benefits that bail offers is the freedom for you to resume your normal life while you wait for your trial. During this time, we recommend keeping in touch with us in case something changes or if you have any questions. We have helped many, many people through this process, so we can help you understand what to expect when it comes to the court system. When you need a bail bond or you have questions about how we can help you bail out a loved one, please contact us as soon as possible. Our bondsmen work as quickly as possible and are here to answer your questions. ASAP Bail Bonds serves the greater Atlanta metro area, including Cobb County. Call us day or night. Bail bonds might seem confusing, especially when you are stressed out by the arrest of a friend or family member. Luckily, here at ASAP Bail Bonds in Cobb County, we are here to answer some of the most frequently asked questions about bail bonds, and to offer you fast, caring service when you need to bail someone out of an area jail. In an effort to make our processes as transparent and easy to understand as possible, we consistently add new content to this page and to our blog. 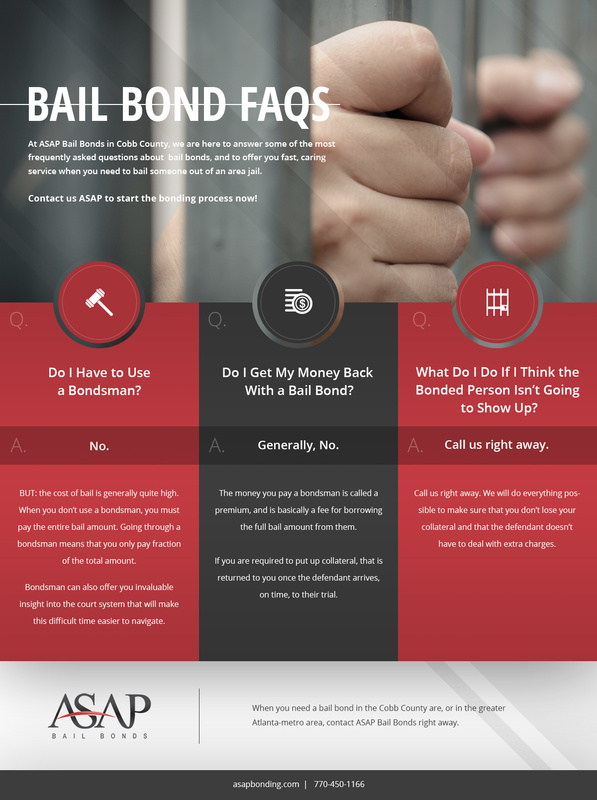 Check back often to learn more about ASAP and how bail bonds work. Contact us as soon as possible to get the ball rolling: we work as quickly as possible because we understand how important it is to allow everyone to get back to their normal lives before a trial. In addition to our bail bonds, we also offer a free warrant search that covers the Atlanta metro area, as well as free consultations about bonds where we will cover the costs and responsibilities with you. No. If you have the money to bail someone out of jail on your own, you don’t have to use a bail bondsman. However, there are several downsides to bailing someone out on your own. First, the cost of bail is generally quite high. When you don’t use a bondsman, you must pay the entire bail amount. While the entire amount is refunded to you if the arrested person shows up for their trial on time, many people find that the cost is just too high. Bonds give you the opportunity to bail someone out at a fraction (usually 10 percent) of the total bail amount. The bondsman assumes financial responsibility for the arrested person in the eyes of the court and pays the full bail amount. The person who pays the fees for the bond is responsible for providing the premium and collateral in the event that the defendant fails to show up for court. Another reason that going through a bail bondsman is beneficial is that they understand how the court system works and can give you helpful advice about what is expected of the defendant. While they aren’t lawyers, they can tell you why it is important to comply with court orders as well as inform you of what your responsibilities are when you are out on bail. Do I Get My Money Back With a Bail Bond? The short answer is: usually, no. The money that we, or any other bondsman, charge for a bail band is called the premium. We charge the premium so that we can run our office more efficiently: the premiums help ensure that we are able to process paperwork as quickly as we can so your friend or family member can be released faster. If we require collateral and you use cash, that is returned to you as soon as the person who was bonded out appears, on time, to their court date. What Do I Do If I Think the Bonded Person Isn’t Going to Show Up? If you paid for a bond for someone and put up collateral, you are obviously concerned about the defendant showing up for court. If you are worried that they aren’t going to make it to their trial, contact us right away. We will do everything we can to ensure that they make it there. Not only do we lose all of the money we put up for bail if the defendant fails to appear, but we also have to seize your collateral. The system works best when everyone gets what they want, so we try to make it as clean and simple as possible. We encourage clear and open communication between all parties to make this process run smoothly. If you have a close friend or a family member in jail and you need to bail them out, contact us at ASAP Bail Bonds in Cobb County. We have locations all around the greater-Atlanta area, and we’re ready to help you, 24/7. We have many helpful features available on our website, including the ability to sign up for a bond online, so please browse the rest of our site to learn more about ASAP.